Policy focus should be on the family and early intervention for disadvantaged children. (Francisco Kjolseth | The Salt Lake Tribune) Gov. 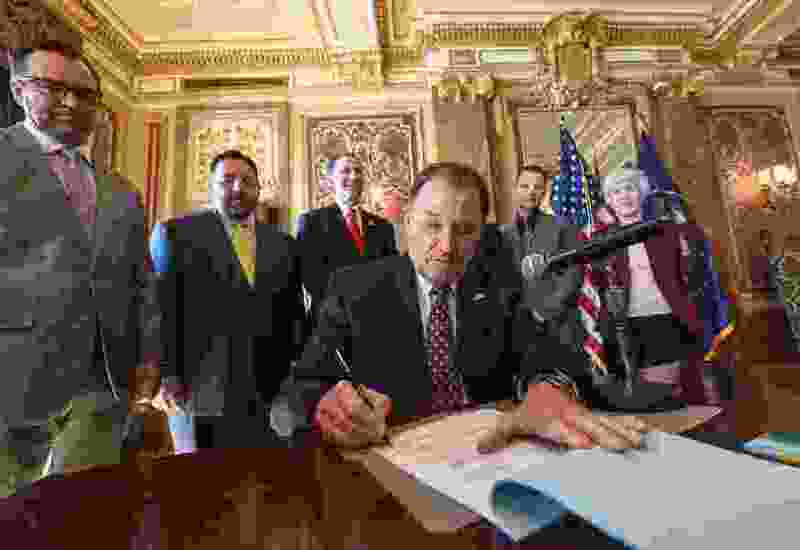 Gary Herbert is surrounded by state representatives in the Gold Room of the Utah Capitol on Tuesday, March 27, 2018, as he sign H.B. 472 - Medicaid Expansion Revisions, which would expand Medicaid healthcare coverage to cover an additional 60,000 Utahns below the poverty line — pending approval from the federal government. The Johnson administration’s efforts in the 1960s to eradicate poverty did not bear much fruit. Nationally, the poverty rate for all people as well as all families dropped significantly from 1960 to mid-1970s, but since then it has increased. The Utah Legislature enacted the Intergenerational Poverty Mitigation Act in 2012 with a broad outline of a plan of action for Utah. Weber County is also making a concerted effort to mitigate intergenerational poverty in the county. First, some concepts and facts related to poverty. The official poverty threshold money income is three times the inflation-adjusted cost of minimum food diet in 1963. Any family below the threshold income, adjusted for family size, composition and age of householder(s), is considered poor and eligible for public safety net programs’ benefits. This official poverty measure is imperfect, because it gives more weight to food expenditure and lumps together other increasingly significant expenditures, such as housing, transportation, utilities and health care. The official measure also excludes non-cash benefits of many public safety-net programs. However, it is the one most used and reported in the U.S. Census. The supplemental measure adjusted for other expenditures and benefits is used for policies to deal with other complex poverty-related issues. Utah has close to 2.2 children per family on the average. In 2016, according to the U.S. Census, national poverty threshold income for a family of four with two children was $24,339, and for a family of five with three children it was $28,643. Using the official measure, Weber Country had a 13.5 percent poverty rate for all families and 39 percent rate for families headed by single mothers with related children below 18 years of age. According to the Utah Department of Workforce Services, intergenerational poverty is when families continue to be in the poverty status for two or more generations. The poverty situation, related to intergenerational income mobility, has not improved over decades. Stanford University professor Raj Chetty finds in his studies that upward income mobility is lowest in the U.S., as opposed to other developed countries, and it varies significantly across regions of the U.S. Even though the odds of upward income mobility in Utah are better than in most states, the recognition for improvement in intergenerational poverty in Utah and in Weber County is on the right track. To break the cycle of poverty public policy, solutions require close cooperation of family and external institutions, such as schools, churches and other nonprofit institutions, with accountability at the public level and of others involved in implementing and carrying out policies. In a study in Economic Inquiry, July 2008, Nobel Laureate economist James Heckman reports that, aside from many factors in human development, wages in adult life depend on cognitive abilities (ability to reason and conduct analysis) and noncognitive abilities (perseverance, motivation, self-control, self-esteem and preference for risk aversion) learned in childhood. Emphasis on tests in schools that enhance cognitive skills are not enough for future economic success and reduction in social pathologies, such as crime, drug abuse, teenage pregnancies and smoking. Family environment with adequate income and early childhood intervention is a significant predictor of these abilities and future success. Public and private institutions must provide resources to poor families for early childhood education, parental education for raising children and marketable technical and behavioral job skills to nonworking poor for employment to reduce the dependency on public assistance. Then, the working poor would qualify for the Earned Income Tax Credit. EITC is the most successful program to boost incomes of low-income working families and reduce poverty rates. Studies show the school performance of disadvantaged children improved the most due to EITC. To incentivize work, the state should also have income-based programs for child care for working families. A mentoring program for children would fill parental gaps in adult supervision, support and guidance.